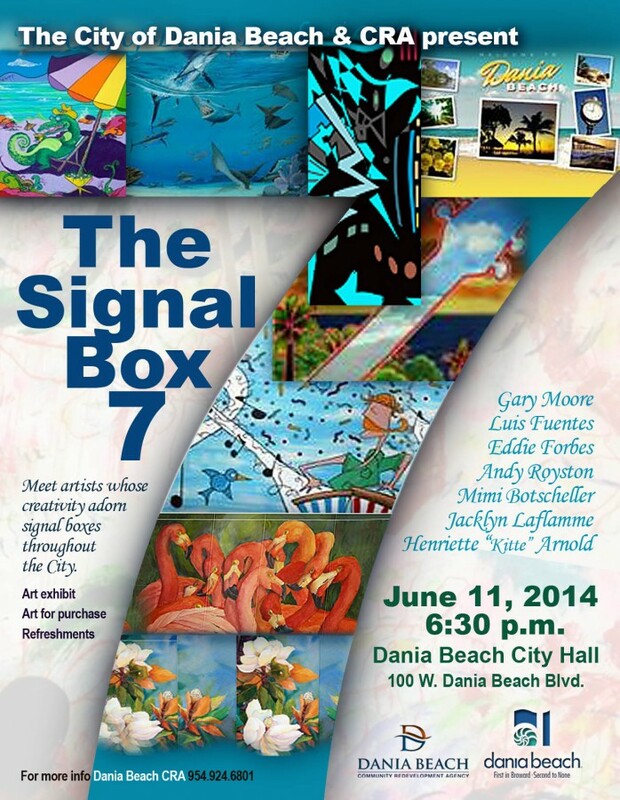 Dania Beach is proud to announce the opening of the new Atrium Gallery located at City Hall. A beautiful space with many possibilities, it will serve as an Arts and Cultural Center featuring exhibition’s, concert’s and so much more. 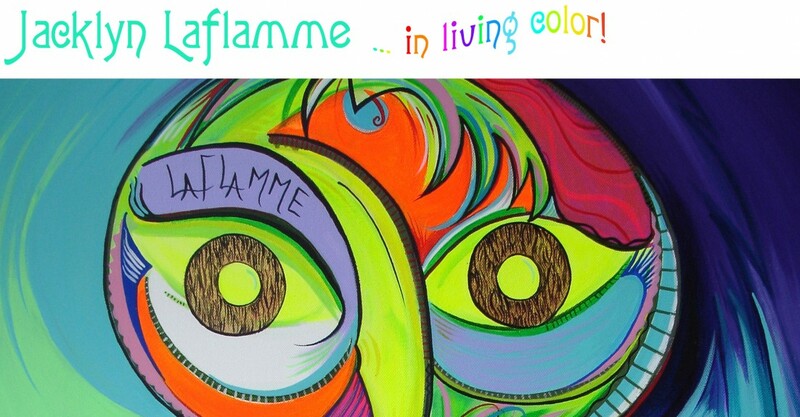 The next event will feature nationally acclaimed artist Jacklyn Laflamme with a one-woman show. Her vibrant, acrylic paintings will be on exhibit from Friday, September 25, 2014 until the end of October. A community night and opening reception is planned for Tuesday, October 7, 2014 from 6:00pm – 8:00pm, at City Hall, light refreshments will be served and it is free and open to the public. Henriette “Kittie” Arnold has been instrumental in getting the gallery up and running, she will be curating all future exhibitions. Featured artists will be invited to exhibit at the gallery. “The goals for the gallery are to have rotating exhibitions on a monthly basis. A gathering place for people to connect, network and bridge together to find creative ways to support one another, local businesses and the community.” stated Henriette Arnold. 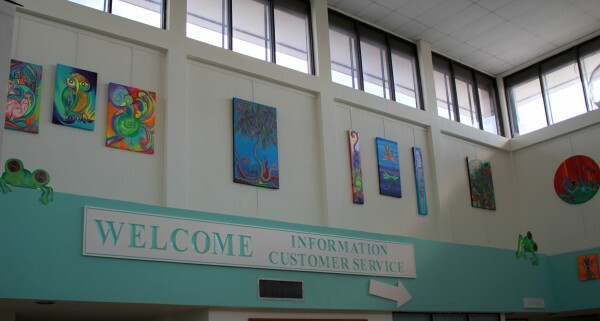 The Atrium Gallery is currently accepting applications for future exhibitions for more information Contact Henriette Arnold 954-920-4574. Categories: Art In Public Places, Events, Exhibitions, Paintings | Tags: acrylic painying, alligators, art, art wraps, artists, atriums, atrtworks, beach art, beaches, broward county, broward cultural division, city hall, community, community nights, CRA, crocodiles, culture, dania Beach, Design, eco art, Exhibitions, famous art, famous artists, fish, florida, flowers, Gallery, Henriett Arnold, Henriette Kittie Arnold, Jacklyn Laflamm, large spaces, marine life art, municipalities, openings, owls, public spaces, signal boxes, south florida, the fairytale project, the signal box 7, Tourism, tourist art, watercolors, wildlife | Permalink. Categories: Art In Public Places, Events | Tags: acrylic painying, alligators, Andy Royston, art, art wraps, artists, beach art, broward county, city hall, CRA, crocodiles, culture, dania Beach, Design, eco art, Eddie Forbes, famous artists, florida, flowers, Gary Moore, Henriett Arnold, Henriette Kittie Arnold, image 360, Jacklyn Laflamm, Luis Fuentes, marine life art, Mimi Botscheller, signal boxes, south florida, the fairytale project, the signal box 7, Tourism, tourist art, watercolors, wildlife | Permalink.